In order to nurture leadership skills expected for global leaders in a multi-cultural society, it is essential to have an environment for students to develop the ability to be flexible in order to achieve their goals, working hard day and night and engaging in friendly competition. 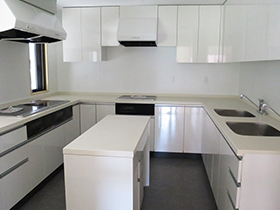 In order to implement this university’s traditional interactive type of higher educational research, there is a residential college on campus. 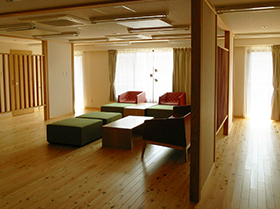 A place equipped with an educational environment that is unique to the Graduate School of Advanced Integrated Studies in Human Survivability (GSAIS or Shishu-Kan), a place where students can concentrate on their research and learning in daily life, and a place where special lectures and discussions on leadership “jukugi” and other lectures are held. In addition to offering a wide range of facilities and conveniences in order to enable students to focus on research and learning, full-time faculty members also reside here as mentors, taking care of the daily life and extracurricular activities, emphasizing each student’s skills, mental strength, and physical condition. 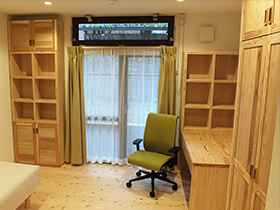 Once the students of Shishu-Kan enter the residential colleges, they spend five years living together in a community consisting of students from different cultures and different fields of study, and through interaction and exchange of dialogue, they accumulate knowledge from each other. 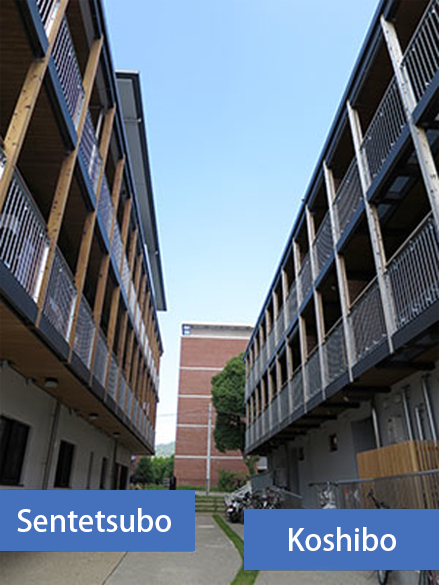 The residential college consists of three facilities that are currently operating, the First Residential College (Koshibo), the Second Residential College (Sentetsubo) in the Kyoto University Yoshida Campus (at the end of the Faculty of Medicine Campus), and a third facility, a new facility operating since the end of February 2015 on the third floor of the Higashi Ichijokan (former site of the Sakyo Ward Office) Kyoto University, Shishu-Kan Main Building,. 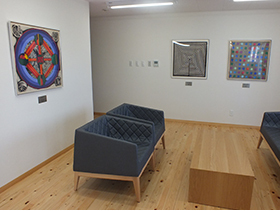 There are also many works of art housed in the facility, and an environment of deep thinking and learning has been created in which students can experience, the various arts and traditions that have been cultivated in and inherited by Kyoto, the city that is the cultural center of Japan. 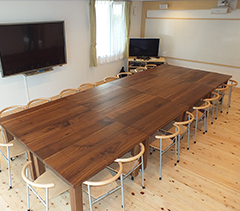 Furthermore, the students of Shishu-Kan mainly have classes in the newly constructed Higashi Ichijokan, Kyoto University. It is the main building of the Shishu-Kan, and students use it as the center for their education and research activities during the day. 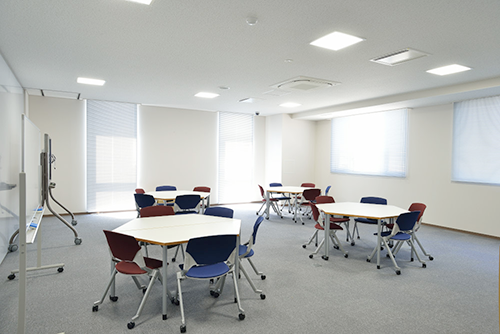 Students can also use the educational research facilities and materials of the Kyoto University Library and it’s departments, as well as the Tachibana Hall, just south of Koshibo, as a venue for conducting seminars. 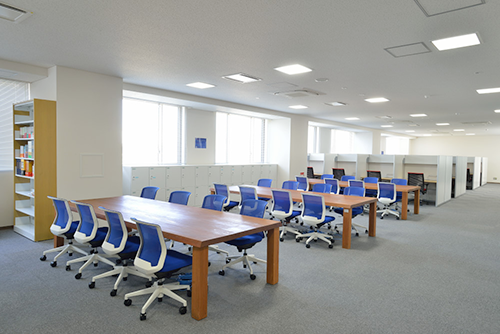 As the education and research facility of GSAIS, the Higashi Ichijokan has lecture rooms, seminar rooms, and faculty rooms equipped with the latest lecture system and Web conferencing system, as well as a self-study room (Learning Commons) equipped with a library corner and communication space. It is well equipped as a place for research and education and as a place for discussions and interaction among students and between students and faculty members. 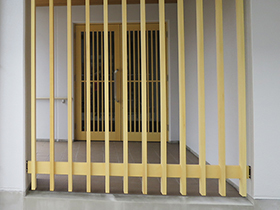 The bright entrance with lavish wood lattice work exudes a typical Japanese atmosphere of harmony. This is a Conversation Room/Cafeteria that functions as the place where students can discuss and exchange information with students from a variety of different fields and specializations and can hone and develop themselves through interaction. Located next to Lounge 1, it is well equipped with facilities and built with the hope of fostering broad perspectives and a wide range of viewpoints including the ability to be creative while enjoying food together with one’s peers. 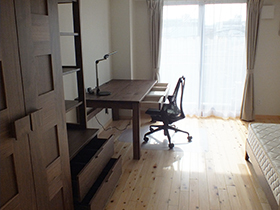 It is equipped with furniture made of walnut, and each room has a large balcony. Open spaces on the second, third, and fourth floors, respectively. One can admire the Mount Daimonji and the Medical Campus from the window on the eastern side. These open spaces face the students’ individual rooms and can be used as spaces for information exchange and interaction. 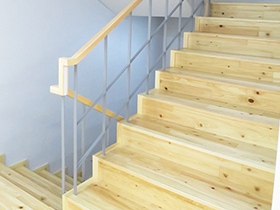 An eye-catching wooden staircase made of beautiful wood that continues from the corridor. Light wells have been introduced to fill the center court with natural light and to create an image of a spring that wells up with rain . 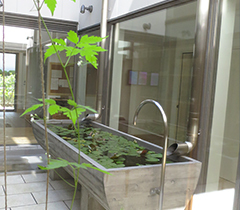 Student’s can even see goldfish swimming, it has transformed into a place where students can feel the seasons and nature when the lotus flowers bloom. Various books from all times and places to learn the philosophy of Shishu-Kan can be found here. Students can relax on the tatami mats, thinking and contemplating. 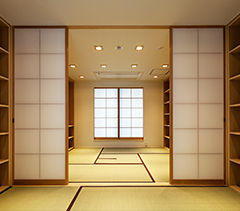 A Japanese-style room where students can also enjoy tea ceremonies. It is also a place where they can broaden their knowledge, develop a profound and solid expertise, and contemplate and ponder at ease, with friends or alone. A place for interaction among students and between students and faculty members. 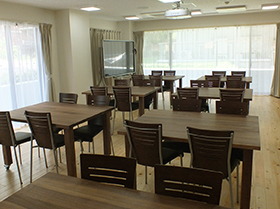 It is also a place for conducting “jukugi” seminars and the central place for friendly competition. A calm environment with furniture that is made using the same Japanese cedar wood used for the columns and beams of the building. 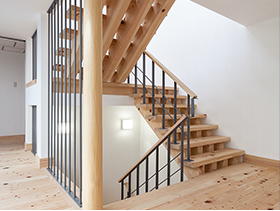 Made using domestic materials such as Japanese larch and ceder wood, the floor is made of Japanese cypress, and the wooden staircase incorporates a lot of light. 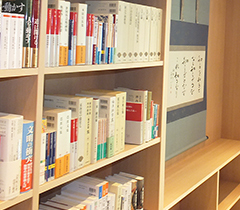 There is a Learning Commons at the Shishu-Kan Higashi Ichijokan for graduate students. Apart from desks for each student to work, there is space to enable students to conduct discussions and workshops together. Furthermore, people who are employed at public offices and in corporations (excluding those who receive salaries and who are exempt from their duties) and those who are self-employed, that is, those who are fulltime workers and can systematically engage with long-term study, can apply for long-term study after deciding to enroll. If the candidate is allowed to take the course as a long-term student after screening, the maximum length of the course of study will be 10 years. In addition, if the candidate has a master’s degree at the time of enrolment, then he/she can obtain a doctoral degree in a minimum period of three years through the screening after completing the prescribed program. Please enquire at the Academic Affairs Office for details of the system.